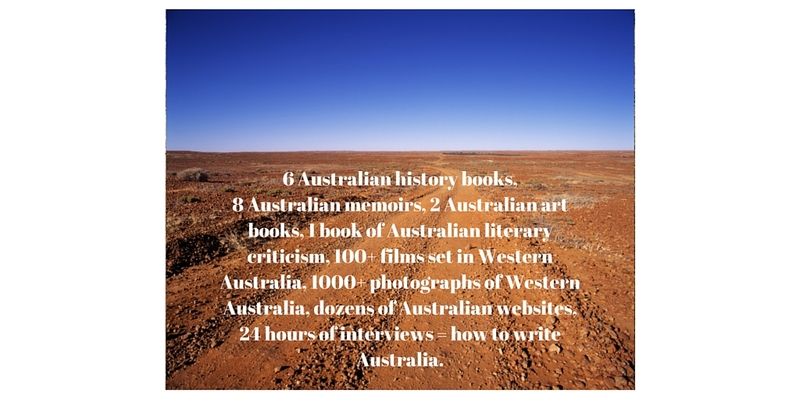 Writing about Australia has not been easy. I live in the Western U.S., not Western Australia. Twice I’ve tried to plan trips only to have life with a capital L come clutching for my dollars. In fact, I had hoped to be in Australia right now, carting my novel about. Alas, release dates are postponed, family members die. Change. Change is always what challenges and propels us. As it turns out, I’m glad for the way things turned out. The book, the preparations, the promotions—all are much better for my having had this extra time and for my having had to do the research completely on my own and basically from scratch. I learned more about the art of research itself from this project than from any other. I also learned how a book can take on its own existence, how it can want you to write it so badly that it brings material to you. I’ve told the story before of how many times Phil and I have picked up a film to watch, only to get home and discover it was an Aussie production, set in the Land of Oz itself. All’s well that ends well, or so they say. Which is also to say I’m completely in love with this gorgeous book trailer, which came together over the last weeks thanks to the combined efforts of some very talented people in my circle. It, too, was the case that we had no original footage, no budget for actors, so the producer had to rely on clips from public domain. I think he’s done a stupendous job of editing and laying tracks and creating a sense of mystery. If you haven’t already figured it out, you can just click on the image above or click here to replay it. I hope it has the same effect on you that it’s had on me, and that is to make you want to read the book! Release day is March 29. We have launches planned at Auntie’s Books in Spokane, Washington, on Aoril 21 at 7 p.m. and at the Lewis-Clark Center for Arts and History in Lewiston, Idaho, on April 28 at 7 p.m. Many more events and book signings in the works, so do stay tuned. Oh, and please consider inviting me to your town. I’d love to come! Email me at coom1286@hotmail.com. Let’s make a plan!